Super-welterweight Mwakinyo knocked out Argentine journeyman Sergio Gonzalez in the third of the eight-round scheduled non-title contest at the Kenyatta International Convention Centre (KICC0 during last weekend’s SportPesa Nairobi Fight Night. Although the duo fight in different weight divisions, Okwiri who weighs 71kg said he desires to move a berth below from the middleweight rank to super welter. He said he is ready to shed some 3 kilos to make the cut in the super-welterweight class. “After keenly watching Mwakinyo fight the Argentine in the main undercard, I feel I should be given an opportunity to fight him in the near future. He, surely, took longer than expected to floor the journeyman from Argentina. I take this opportunity to invite him for a contest,” said Okwiri. Although the Tanzanian couldn’t be reached for comment, Okwiri called on promoters to consider the matchup. Mwakinyo accompanied Zarika for specialised training in the United Kingdom courtesy of SportPesa sponsorship. “This is a fight I desire to fight. 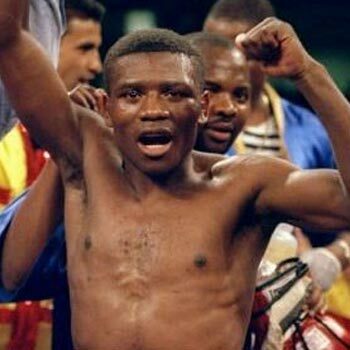 He will surely meet his Waterloo if both of us set foot into the ring,” said Okwiri. The Prisons officer stopped Tanzanian Pascal Bruno in the third round to stretch his pro record 4 (2kos) wins, 0 loses and 1 draw. Okwiri said he has now stretched his record further and now wants bigger opportunities. “I hope the five bouts I have fought will open the big windows of opportunity overseas. But again, it’s a steep learning curve after a long-standing amateur career,” said Okwiri who turned pro in 2017. As an amateur, Okwiri has represented Kenya in many events including the Olympic Games in Rio and the now-defunct AIBA Pro Boxing (APB) ranks. He qualified for the Rio Olympics after winning gold in the African qualifiers in Yaoundé, Cameroon. In the 2014 Commonwealth Games in Glasgow, where he featured in the 69kg lost, he to Thulani Mbenge (RSA) 3:0 in the second preliminary round. He had, however, won against Merven Clair (MRI) 3:0 in the first preliminary round. In 2013, Okwiri participated in the AIBA World Championships in Almaty, Kazakhstan and booked the 13th place in the 69kg after he lost to Fred Evans (WAL) 3:0 in the third preliminary round. He had won against Erkin Bolotbek Uulu (KGZ) 3:0 in the second preliminary round and Daniel Lewis (AUS) 3:0 in the first preliminary round. In the 2007 All Africa Games in Algiers, he finished 7th in the 64kg after he lost to Abderrahmane Salah Araby (Egypt) 18:5.